Jupiter’s X-ray emission (in magenta and white). Credit: Joseph DePasquale, Chandra X-ray Center. 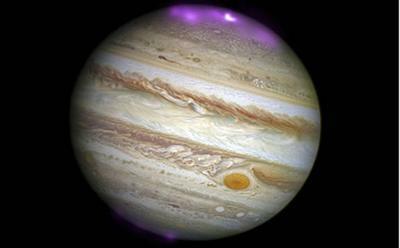 Solar storms trigger Jupiter’s intense ‘Northern Lights’ by generating a new X-ray aurora that is eight times brighter than normal and hundreds of times more energetic than Earth’s aurora borealis, finds new research involving the University of Southampton. It is the first time that Jupiter’s X-ray aurora has been studied when a giant storm from the Sun has arrived at the planet. The dramatic findings, obtained using NASA’s Chandra X-Ray Observatory, complement NASA’s Juno mission this summer which aims to aims to unlock the secrets of Jupiter’s origin, helping us to understand how the solar system, including Earth, formed. Understanding the relationship between the two biggest structures in the solar system – the region of space controlled by Jupiter’s magnetic field (i.e. its magnetosphere) and that controlled by the solar wind - is important for the countless magnetic objects across the galaxy, including exoplanets, brown dwarfs and neutron stars. The Sun constantly ejects streams of particles into space in the solar wind. When giant storms erupt, the winds become much stronger and compress Jupiter’s magnetosphere, shifting its boundary with the solar wind two million kilometres through space. The study found that this interaction at the boundary triggers the high energy X-rays in Jupiter’s Northern Lights, which cover an area bigger than the surface of the Earth. The discovery, published in the Journal of Geophysical Research – Space Physics, a publication of the American Geophysical Union, comes as NASA’s Juno spacecraft nears Jupiter for the start of its mission this summer. As part of its mission, Juno will investigate Jupiter's relationship with the Sun and the solar wind by studying its magnetic field, magnetosphere and aurora. The researchers hope to find out how the X-rays form by collecting complementary data using the European Space Agency’s X-ray space observatory, XMM-Newton, and NASA’s Chandra X-ray observatory. The impact of solar storms on Jupiter’s aurora was tracked by monitoring the X-rays emitted during two 11 hour observations in October 2011 when an interplanetary coronal mass ejection was predicted to reach the planet from the Sun. The scientists used the data collected to build a 3D spherical image to pinpoint the source of the X-ray activity and identify areas to investigate further at different time points. The UCL-led study also involved researchers from NASA Marshall Space Flight Center, Boston University, Observatoire de Paris, MIT, Southwest Research Institute (SwRI), University of Leicester, Japan Aerospace Exploration Agency (JAXA) and University of Michigan. It was funded by the Science and Technology Facilities Council (STFC), NASA, the Natural and Environmental Research Council (NERC) and the Japan Society for the Promotion of Science (JSPS).